Hey friends, previously i have explained how to use SQL injection and XPath Injection to hack websites. 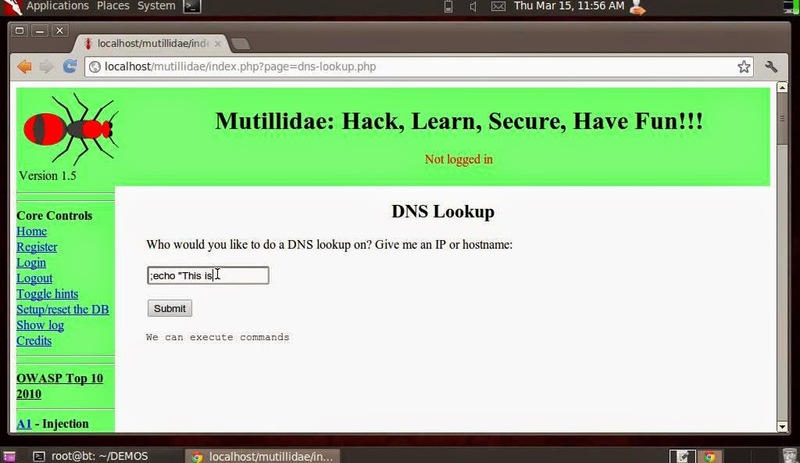 Today i will teach you another type of injection technique that if executed properly can give you complete ownership of victim's website, called Command Injection. When user input is used as a part of system command, an hacker may inject system commands into the user input..Ahh..confusing...:P Lets understand in clear and simple words..
Command injection is an attack method in which we alters the dynamically generated content on a Web page by entering shell commands into an input mechanism, such as a form field that lacks effective validation constraints. We can exploit that vulnerability to gain unauthorized access to data or network resources. When users visit an affected Web page, their browsers interpret the code, which may cause malicious commands to execute in the users' computers and across their networks. The purpose of the command injection attack is to inject and execute commands specified by the attacker in the vulnerable website. In situation like this, the application, which executes unwanted system commands, is like a pseudo system shell, and the attacker may use it as any authorized system user. However, commands are executed with the same privileges and environment as the application has. Command injection attacks are possible in most cases because of lack of correct input data validation, which can be manipulated by the attacker (forms, cookies, HTTP headers etc.). This can happen in any programming language but its very common in PERL, PHP and shell based CGI. It is less common in Java, Python and C++ ..:P i haven't tried it yet there :D tried once or twice but not able to do so, that why uncommon..:P.
Now similar to SQL injection or XPath injection, our goal is to inject the shell command into the email parameter but make sure code before and after the email parameter remain syntactically correct otherwise the injection will not execute. Note: For the missing puzzle part, we need to ensure that the mail command runs properly and exits properly basically i want to focus on syntax, it should be syntactically correct. For example mail --help will runs and exits properly. Now we can add other additional shell commands by separating the commands by a semi colon (;). Now what the above command will do..:P You all guys are just reading things like novice hackers.. Any Guess...:P ok..let me explain.. The above shell command will runs the mail --help and then downloads the attack program from somehackersite.com and executes it on victim, allowing the hacker to perform the arbitrary commands on the vulnerable website. In most cases provide the complete access to the root directory..:P Now do whatever you want to do..
That's all my friends. I hope that you all have enjoyed the tutorial, if you have any doubts or queries ask me in form of comments. Copy Cats its last warning from Isarg uttamnagar, stop copying our articles, if you copy articles always mention the source. Otherwise get ready for DMCA penalty and negative rating on Google.